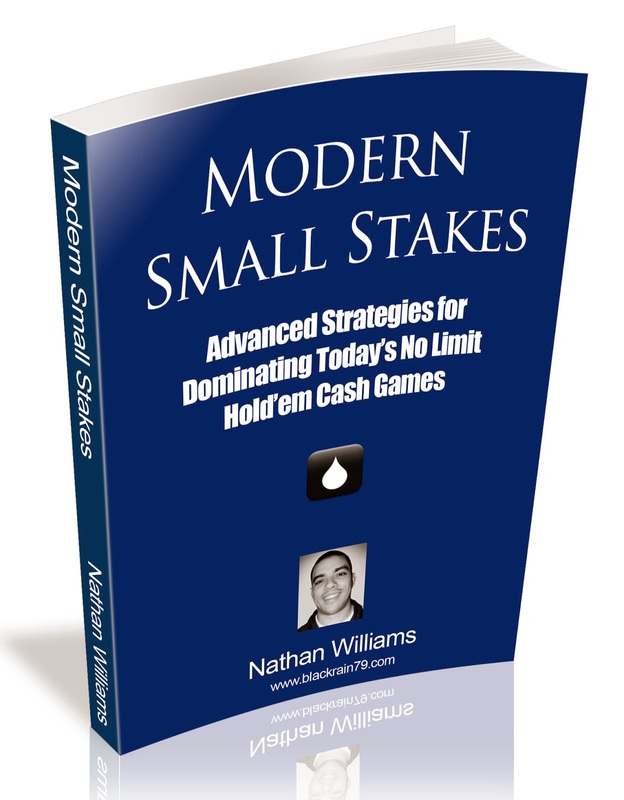 Announcing the Release of my 2nd Book "Modern Small Stakes"
Well, it is nearly 7 months now after the promised release date but I am extremely happy to officially announce the release of my 2nd book, "Modern Small Stakes." This is indeed the long promised "CTM2." I chose to go with a completely different title because this is a completely different book. 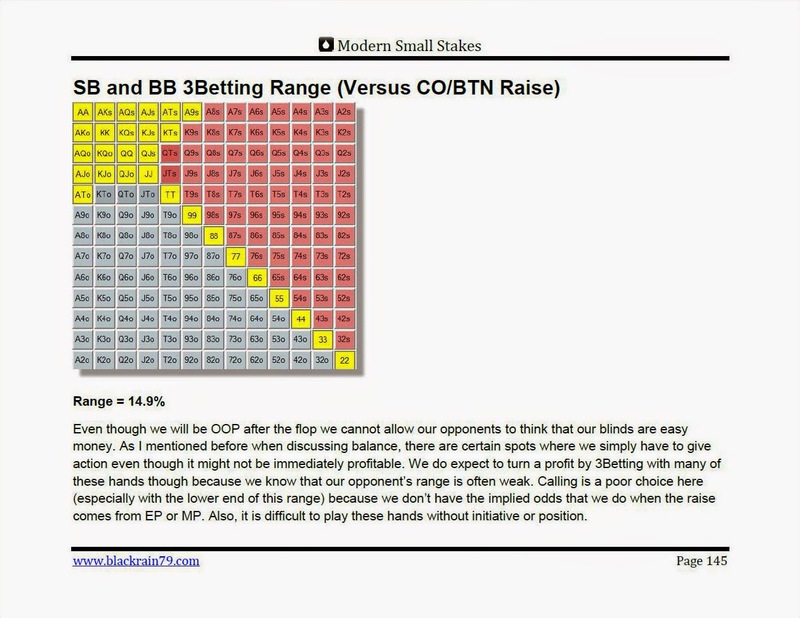 Modern Small Stakes focuses on higher limits (NL10-NL100) than Crushing the Microstakes (NL2-NL5). It is also far more advanced in theory and depth on every level. This book was infinitely harder to write and turned out to be double the length of its predecessor at over 500 pages. When I first started to work on Modern Small Stakes about a year and a half ago I set a goal to write the best book ever written on these limits. I really felt (and still do) that the literature out there is really lacking at these stakes especially regarding today's games. In retrospect this goal of mine was probably a bit foolish because it made me demand perfectionism at every corner and ensured countless revisions and alterations of the text. It also made the length of the book far greater than I had originally planned. I felt that this was necessary though in order to get across everything that I wanted to say about these stakes. These are two of the main reasons why it took so long for me to release this book. I sincerely apologize to all of those who have been waiting for months on end and asking for updates. On the bright side, I am confident that I accomplished my goal. 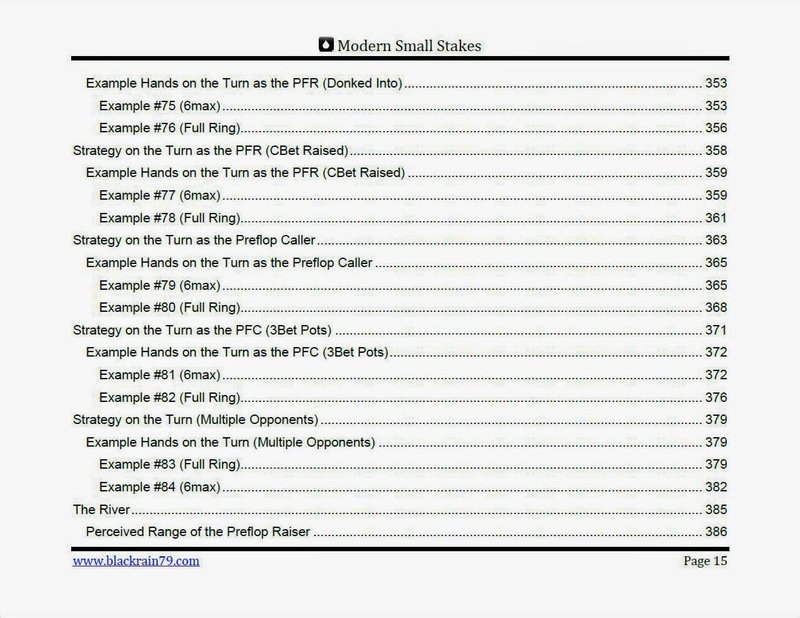 I believe that Modern Small Stakes will be a game-changer in the poker world for full ring and 6max small stakes NLHE cash games. 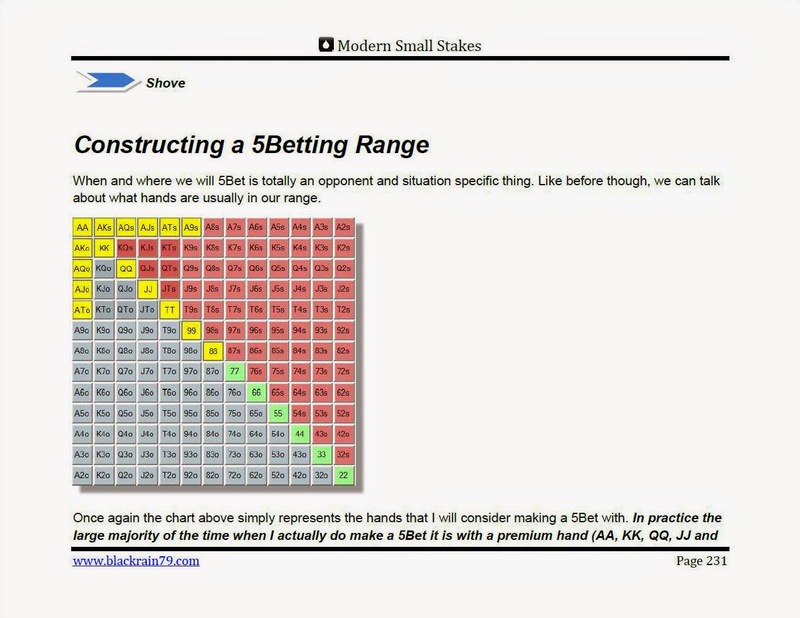 It covers every aspect of the game at these limits in extensive detail from HUD setup, player type analysis, game selection, 3Betting, 4Betting, 5Betting, balancing your range, CBetting frequencies, barreling frequencies, bluffing frequencies, intentionally tilting other regs and so much more. With over 100 highly detailed examples involving real opponents and real situations at these stakes, every effort was made to explain how to translate the theory into practice. Before I say anything else about the book let me post the table of contents so that you can get a better idea of what is included. 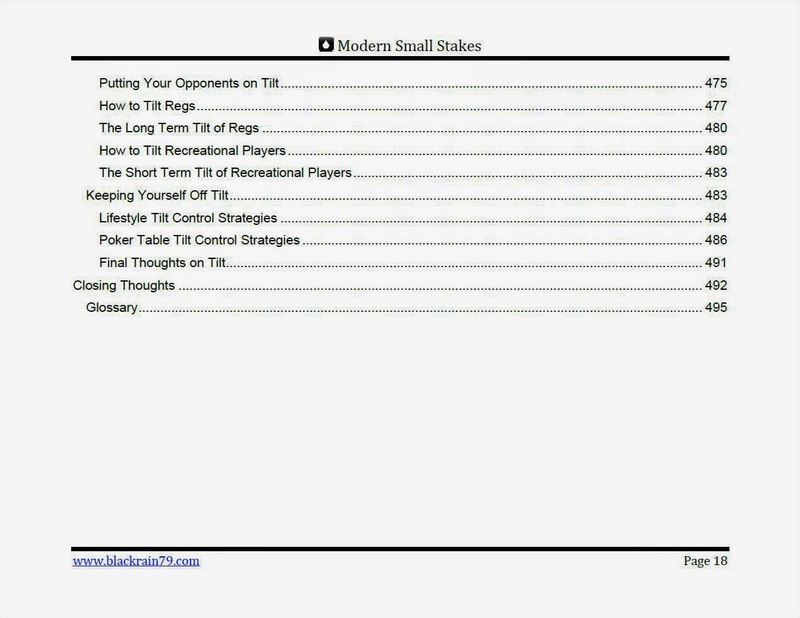 The table of contents is featured below in the official Youtube release video for Modern Small Stakes. Individual screenshots of all 14 pages of the table of contents are also listed below. 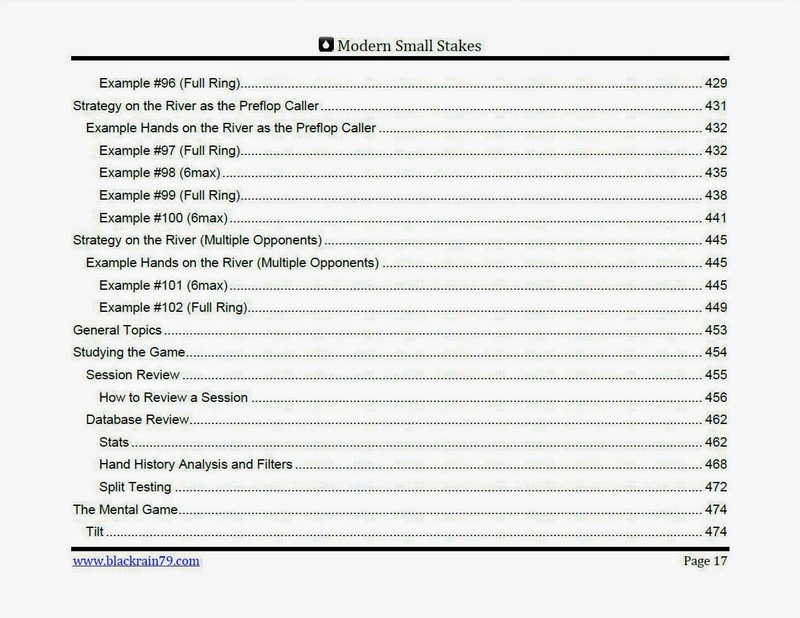 The heart of Modern Small Stakes is teaching how to break down your opponent at these limits to the finest detail. This is why there is extensive discussion of effective HUD use throughout this book. 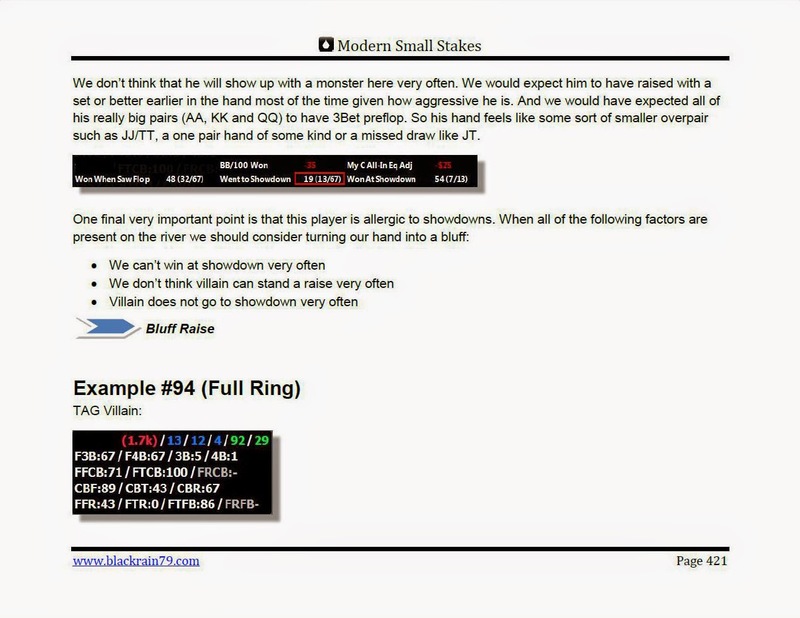 In MSS I also assume that your opponents are reasonably good thinking regulars 95% of the time. Therefore, issues of balancing your range in all situations play a heavy role as well. 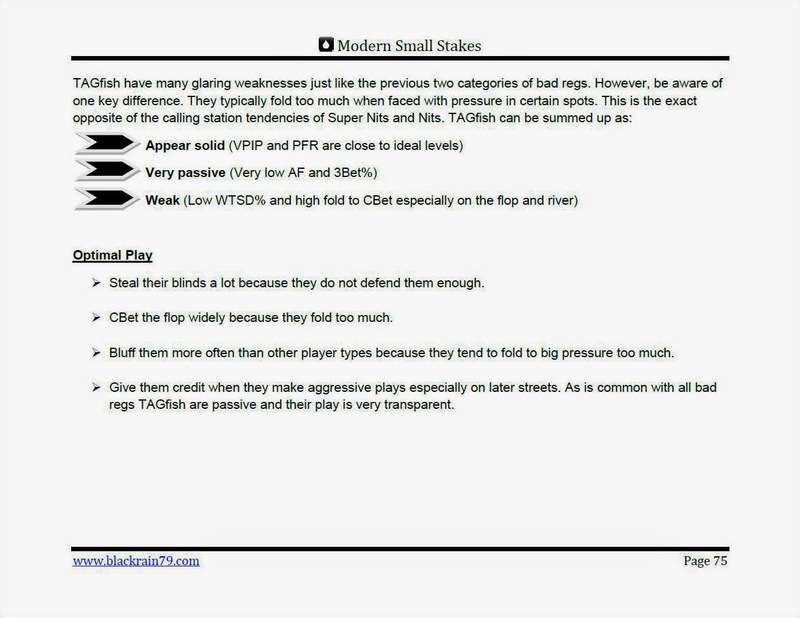 Whereas CTM consisted of a playbook macro type approach to exploiting the terrible players who populate the very lowest stakes, MSS is about micro managing versus fairly good players. What becomes evident to the reader early on in the book is that all players at these stakes really do have fairly significant leaks. They just aren't as readily noticeable as they are with the massive donkeys who dominate every table at the lowest limits. 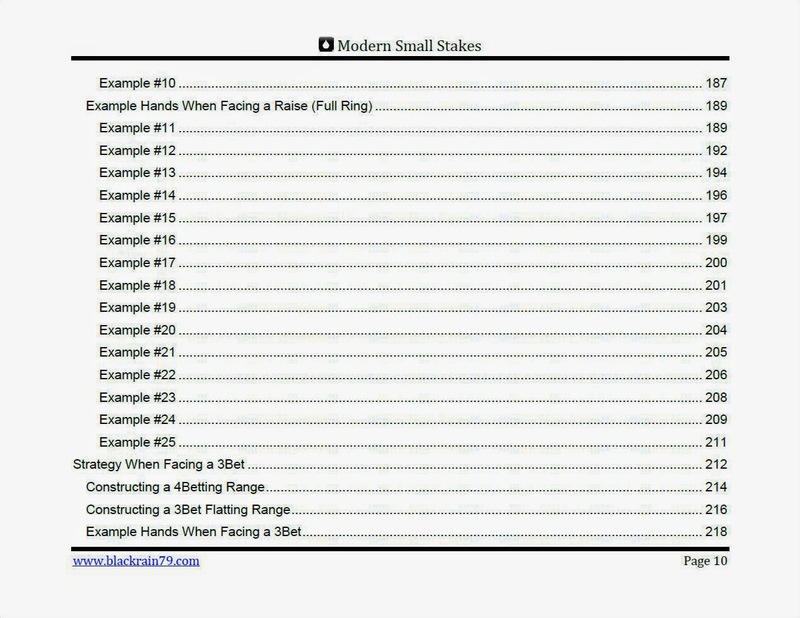 This is why Modern Small Stakes is extremely example heavy (102 of them to be exact and roughly 50% 6max and 50% full ring). 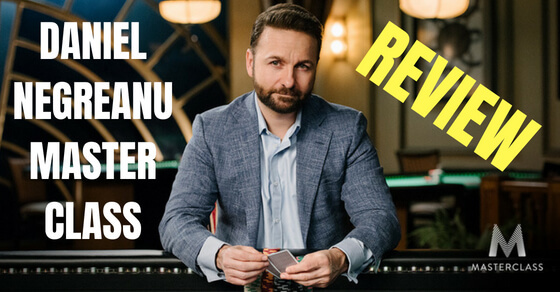 As you move up the stakes success becomes more and more about throwing the "standard play" out the window at times and finding the line that yields the highest EV for this particular opponent, in this particular situation. Therefore, there are a lot of outside the box, "advanced" or "fancy plays" suggested in this book. But they are always made for the right reasons. My hope once again with Modern Small Stakes is that it takes your game to the next level. More precisely, that it improves your bottom line at the tables. This is why you will find the same linear and practical approach in this book as you did in CTM. There is a vast amount of information presented in this book which covers every aspect of the game. 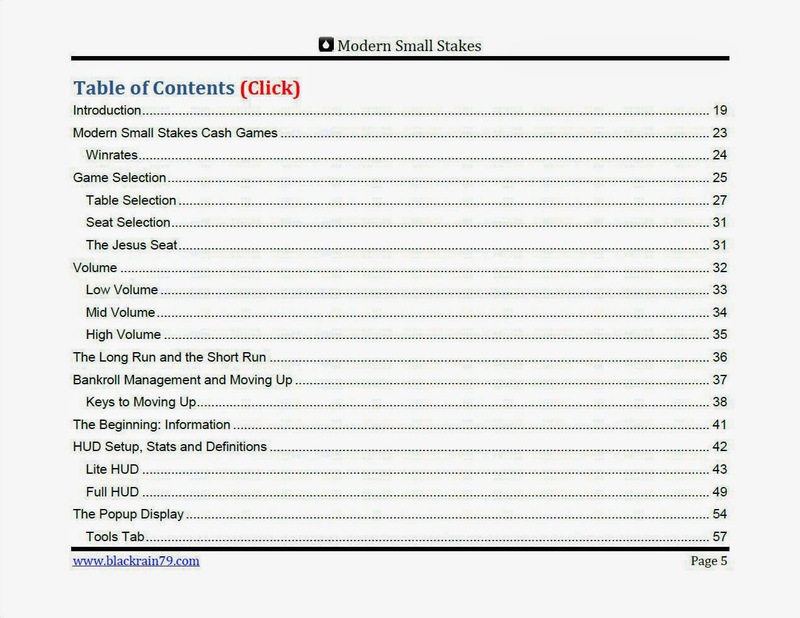 Modern Small Stakes is by no means a casual read. 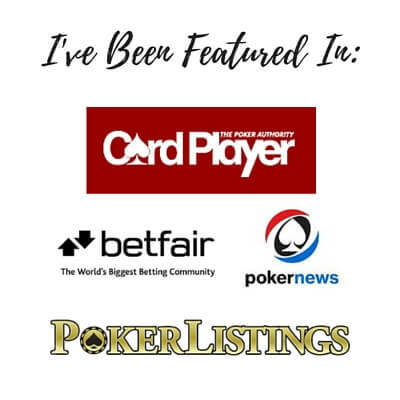 It was created for people who take this game very seriously and are ready to put in the hard hours studying its contents and then applying it at the tables. I want to thank everyone who supported me here on my blog, via email, on DTB, Facebook, Twitter and many other places throughout this (frankly insane) project. You helped me during the countless times in the past year when I didn't know if I would ever be able to finish this book. 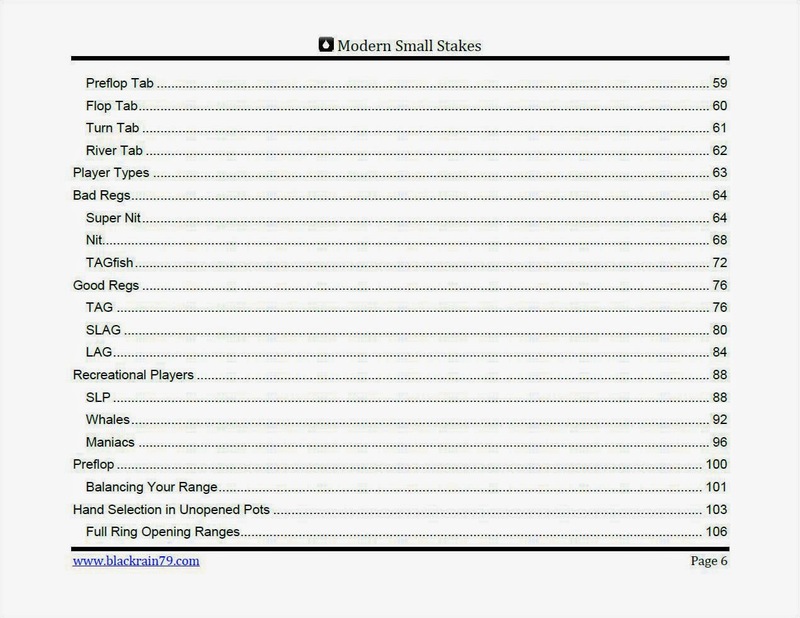 Modern Small Stakes is massive and comprehensive. It was meant to be the "be all end all" definitive guide for these limits. It was absolutely the hardest thing that I have ever done in my life. I am finally satisfied with it now though. I hope you are too. Click "Add to Cart" above. Choose "Checkout with Paypal" and then select "Pay with a debit or credit card, or Bill Me Later" on the next screen. 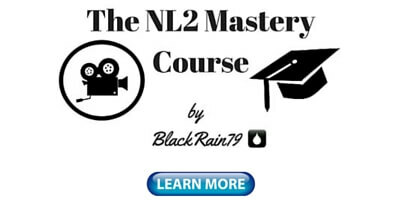 Please send $29.95 to nathan@blackrain79.com and then send me an email with your Skrill email address. 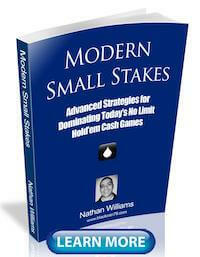 I will reply with your copy of Modern Small Stakes attached ASAP. If you have any questions concerning the payment process please email me at nathan@blackrain79.com and I will get back to you ASAP. 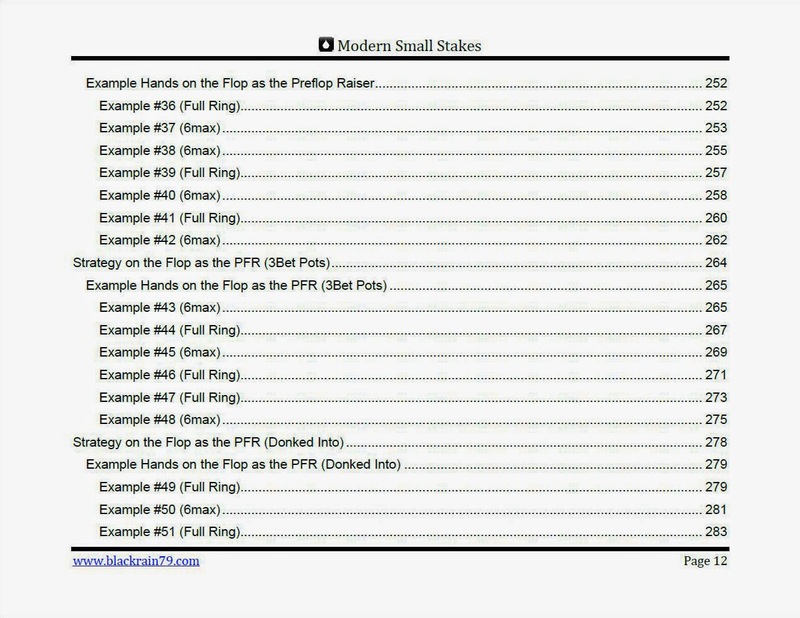 Please be aware that Modern Small Stakes is only available in the PDF format right now. One of my first priorities will be to start working on the Kindle and iPad versions of the book. Just like before with CTM, when these are released they will be made available free of charge to all previous buyers. Bonus materials that are likely to be released alongside Modern Small Stakes in the coming months will also be made available to all previous buyers at no cost. Hey Blackrain, I've been waiting a long time for this. Really excited to see how this can change my game. This has gotten me motivated to get back on my grind and get those hands in. Many thanks! If it's useful for live players I'll buy it at full price but only it's it'll be worth it. Could someone read this if they don't remember much from the first book too? I do talk about this a little bit in the book actually. 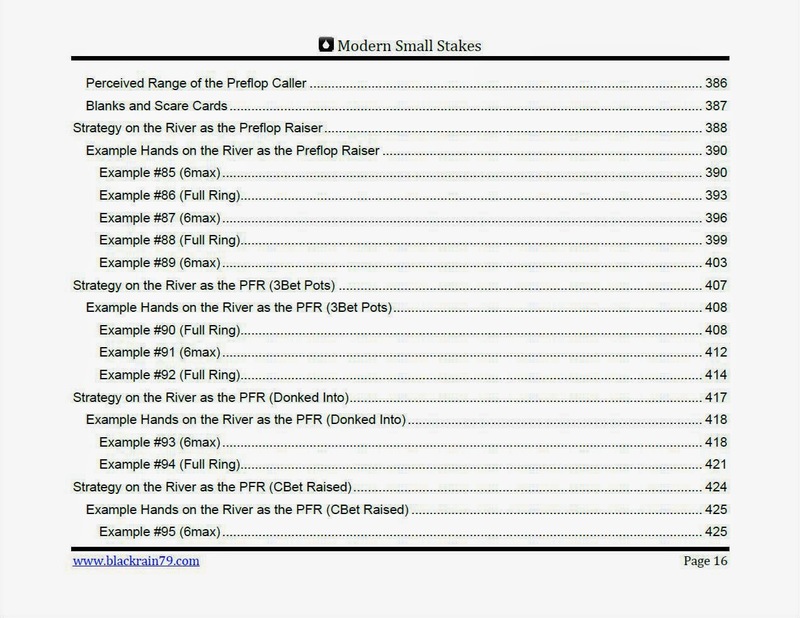 There is no doubt that Modern Small Stakes is very deep in HUD data and statistics. Similar to my first book, it was written more with the online game in mind because I am an online player. 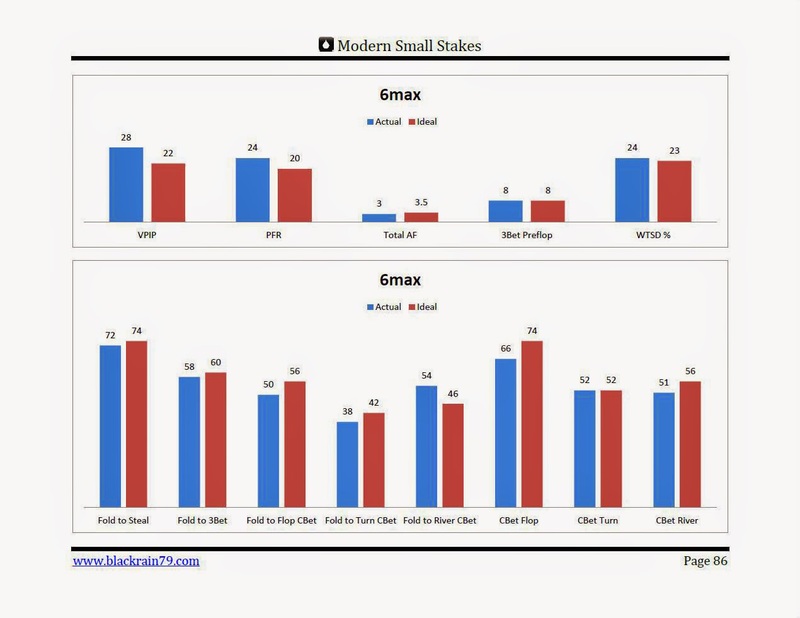 With that said, all of these HUD stats are really just the type of stuff that you should be paying attention to as a live player anyways. 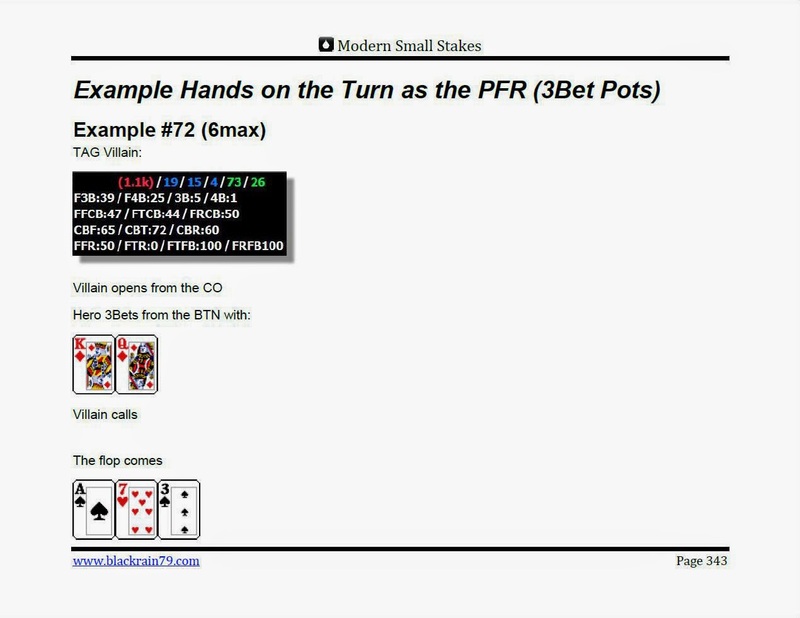 There is only so much pure theory that I can talk about because by the stakes covered in this book (NL10+ online/probably 5/10+ live) most people know the basics already. We therefore need some real reason to take an alternative line that might be more profitable. Overall this is a difficult question for me to answer especially as I am not a big live player myself. You have read my first book. There is quite a bit more use of HUD data when explaining hands in this book. I talk a lot about interpreting what different lines mean though as well which is something that is more pure theory based and perhaps better suited for a live player. Congrats with the release! 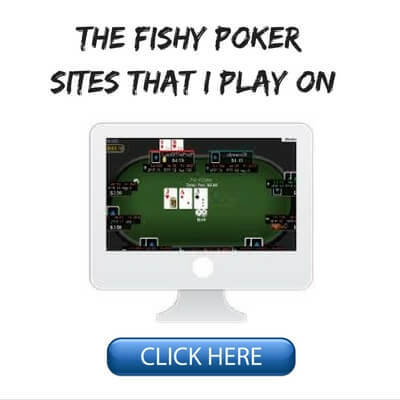 Just wondering do you accepts pokerstars transfer instead? :) Just can't cashout right now, no cash and can't wait to start off with the book..
np mate, will be getting this soon then..
Congratulations and tnx for all the work Nathan! Do you think it's worth it if I'm on the edge of NL10 and NL5 should I read your first book first and then read your second book? Or can I hop right into your second book? It is pretty close if you are at those limits. I would say that CTM is the better choice if you play NL2 or NL5. Both books are useful at NL10. 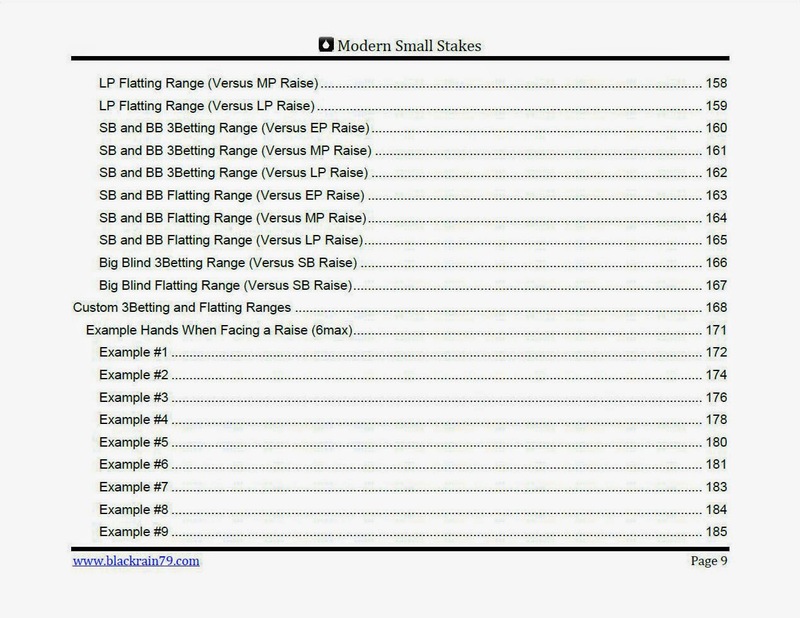 Definitely MSS for NL25 and higher. 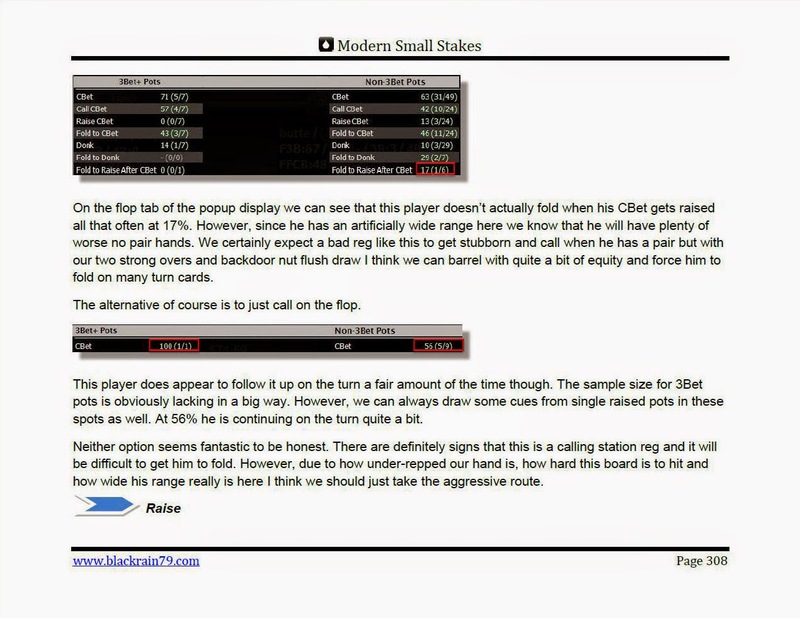 If you are having any kind of trouble at all right now at the stakes you are playing, then I would pick up CTM first. If you are breezing through then go for MSS. CTM is the best poker book I've ever read in terms of tangible results. I've been stuck at NL10 for what feels like forever after crushing at NL5 with your help. I can't wait to get stuck into MSS and get over the hump. Also, I'd like to say thanks for all your hard work and for offering your expertise at such a reasonable price. I made back the cost of CTM within a few days, so it was more or less free! I can't wait to do the same with MSS. Thanks so much for the kind words Martin. I hope MSS helps you break on through! Thanks a lot for everything and best of lucks to you! Thanks Jorge and all the best at the tables! 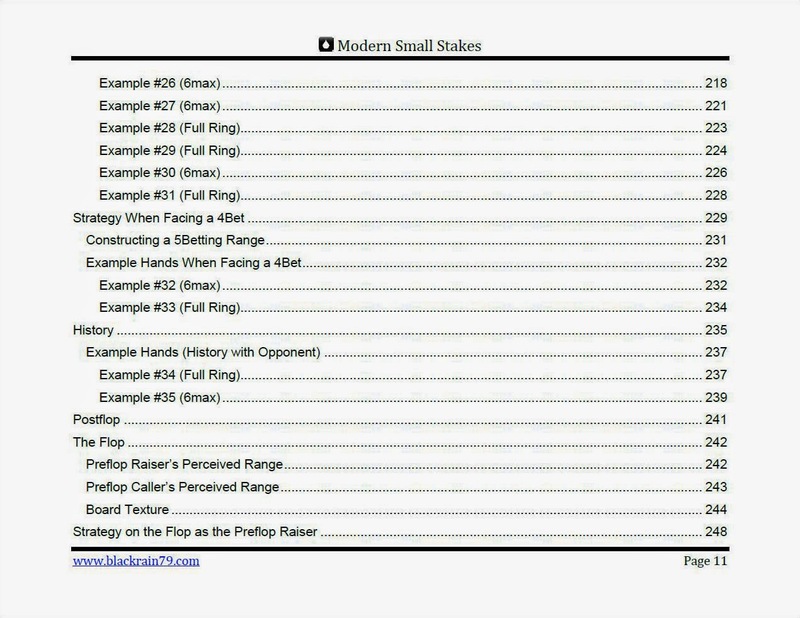 My newest book Modern Small Stakes is mostly about playing against decent and good players. 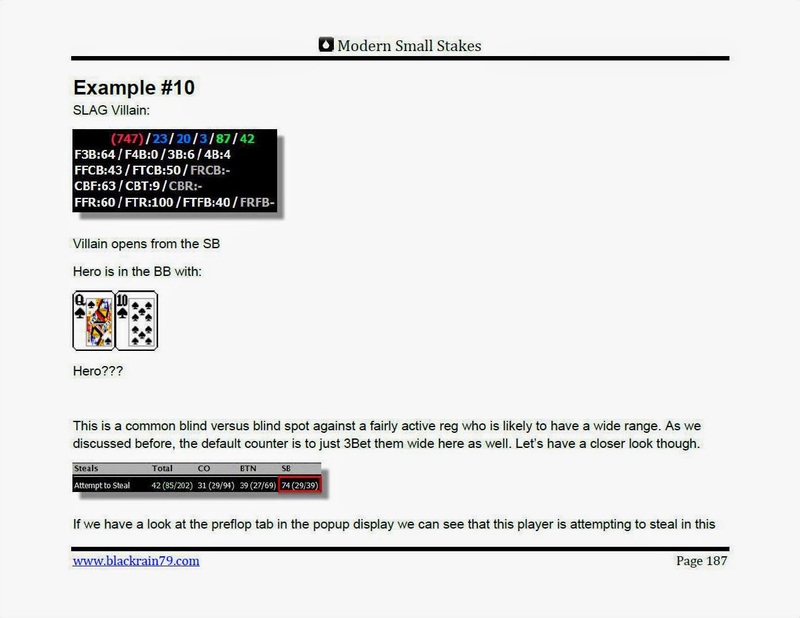 My first book Crushing the Microstakes is more geared towards playing against bad players (fish). I hope this helps. Hey, Nathan! Is there any chance that ur new book will be released in russian in the near future? As it was with CTM. I don't have any plans to start doing any translations for my new book right now. It is possible in the future. It would be many months away at least though. Congratulations Nathan! Hope this one will be as good and as sucessfull as CtM! Just got the new book Nathan, looks good ! Looking to maybe pickup CTM and make sure I am crushin 2,4,5 NL first as you write early on. Do you have it in mobile as well ? 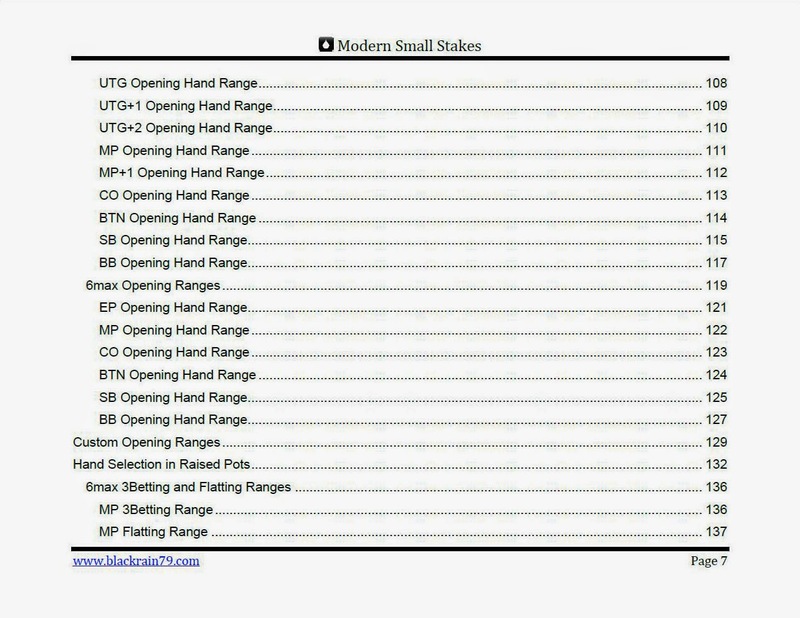 Also just looking at the FullRing opening ranges in MSS, are they much wider than I would find in CTM for 2 & 5 NL eg. ? Awesome, glad you like it! By mobile do you mean Kindle/iPad? If so, CTM comes in those formats. I will start working on it for my newest book very soon. The opening ranges in both books aren't that much different. They are a lot more detailed in MSS though. Maybe give me a link for CTM, I will buy it in 7 days. I am just reverting back to 2 NL FR non/speed right now, lol, it is much more relaxed I must say. I was thinking the rfi ranges for this would be much tighter than in SSM. Hey Kash, you can click the "CTM" tab at the top of this page to find out how to buy it. It will definitely apply very well to those NL2 games. All the best. Congrats on finally finishing it. The contents page and screenshots look very impressive. I shall be ordering a copy at some point. Good luck with the sales campaign! Congrats and thank you Blackrain. Yes, I will create the MSS discussion sub-forum soon for book buyers. It will be a private forum so let me know if your account is not upgraded. These numbers are definitely a bit arbitrary. 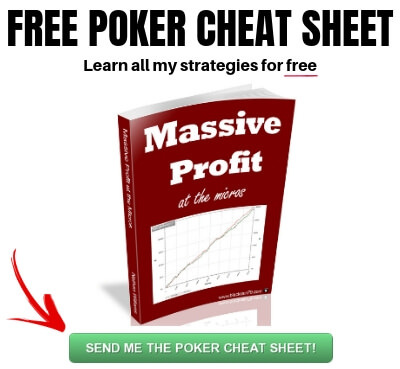 I don't actually refer to a chart when I am playing poker. My EP open for full ring that is suggested in the book is about half what it is for 6max in that position. 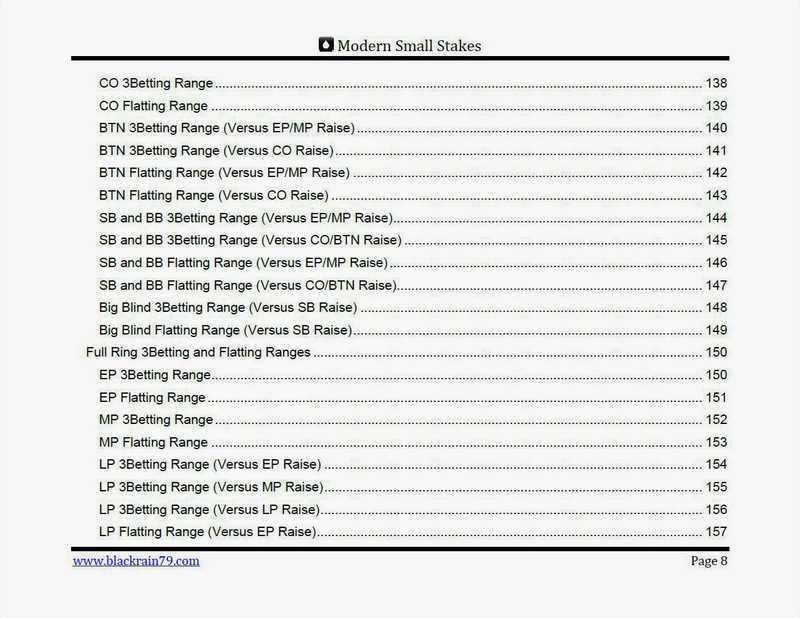 If I understand though you are comparing MP in full ring to EP in 6max because they are essentially the same position? Well 13.4 and 14.6 aren't that far apart. Again, just numbers. Focus on the gist of it what is said, not exact percentages. When will your book come out in Kindle and do I get a discount if I get the PDF version now? I don't know exactly when the Kindle version will be available. It is a very long book and I might have to hire a programmer again to do it properly. It is a priority of mine though. I will make it well known when it is released and it will be available at no charge to all previous buyers. Nathan -I can't seem to get my question to stay on the page when I click "publish". I just want to know - will the book eventually be available on a regular printed version? I prefer my poker books on paper, but I *did* buy the e-version the day I got the notification. I don't have any plans right now to release MSS in a physical version. However, I haven't ruled it out completely. thanks. I know physical copies are expensive, and expose you to greater financial risk. I'm hoping enough people express an interest to make it worthwhile. Enjoying the book. I'm about 210 pages in, and have only seen one thing I'd change & two things I'd "tweak". I will keep you posted and I am glad to hear that you are enjoying the book. Willy = Will Buy? Hope you enjoy. Sorry about the wait once again! I just watched your videos "Crushing the Micros" on DragTheBar. I play 0.01/0.02 stakes poker. Should I buy your new book or the old one? 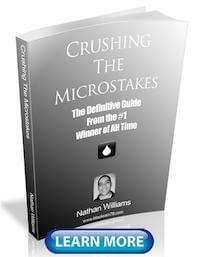 For the stakes that you are playing my old book (Crushing the Microstakes) would be better. My new book covers higher stakes. Do you have a spanish version of your new book? My new book is only available in English right now. It is unlikely that I will be translating it into any other languages. 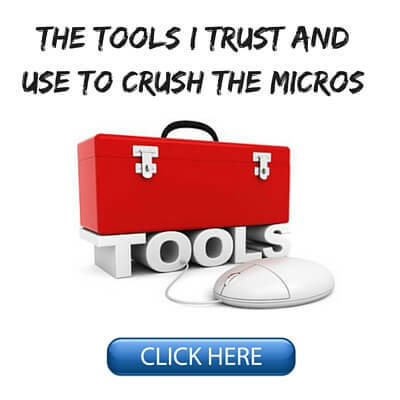 Do you consider writing book about micro/small MTT? Thanks to the Crushing the Microstakes I am wining player now, but I dream about some winings in MTT also, which looks like something impossible. It is unlikely that I will ever release a book about MTTs simply because I am not an expert in them. I am a cash game player. I am glad that CTM has helped you so much! Hi Nathan, thank you for writing those two books ! I'm halfway with MSS, the examples are really good, it makes much more sense to me now, key things I wasn't thinking about, feels like I was playing in the dark sort of speak. There is a lot of key material in MSS and I want to read it more than once, I have a Kobo, I remember CTM had a Kobo version and it gave me the chance to read it on the way to work on the bus. Are you planning a Kobo version for MSS ? Glad to hear that you are enjoying my new book. I know that there is a lot of information in there. Sometimes I think that it might be too overwhelming. Good to get feedback like yours though. I am still working on the alternate versions for the book. I know that I need to get it happening. I will make it well known when it does. Hi Nathan, I'd like to know if the book talks about zoom tables? I'm building my career in this format. I think I mention Zoom briefly at a few points but not regarding a different strategy if that is what you mean. 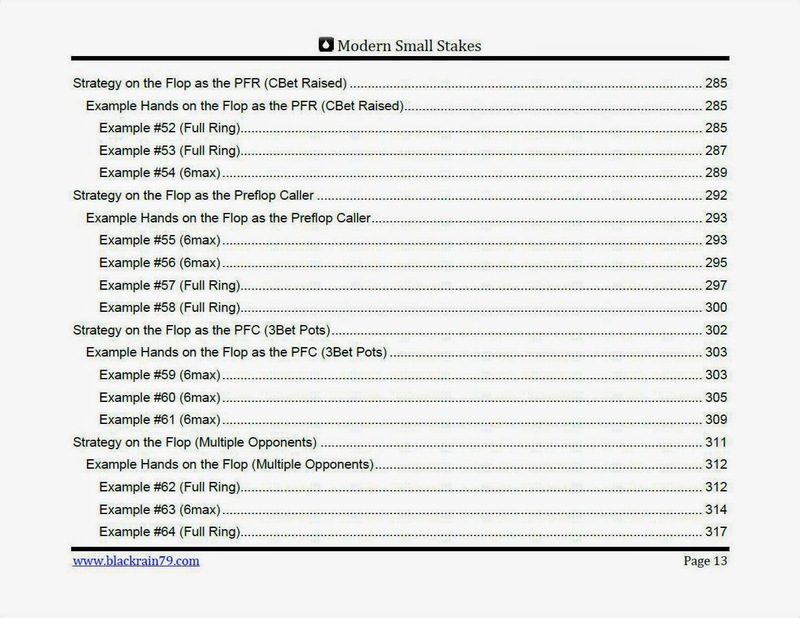 I don't think you are ever going to find a poker book with a focus specifically on this format because the strategical differences from the regular tables just aren't anywhere near large enough to warrant it. What do you mean by "hit the limit"? Well I would never really recommend not using a HUD in today's games but against unknowns yes I think the recommendations are fine. I prefer to 3Bet them quite heavily especially in spots where the action is around the button. We will get more credit because it is a first encounter. 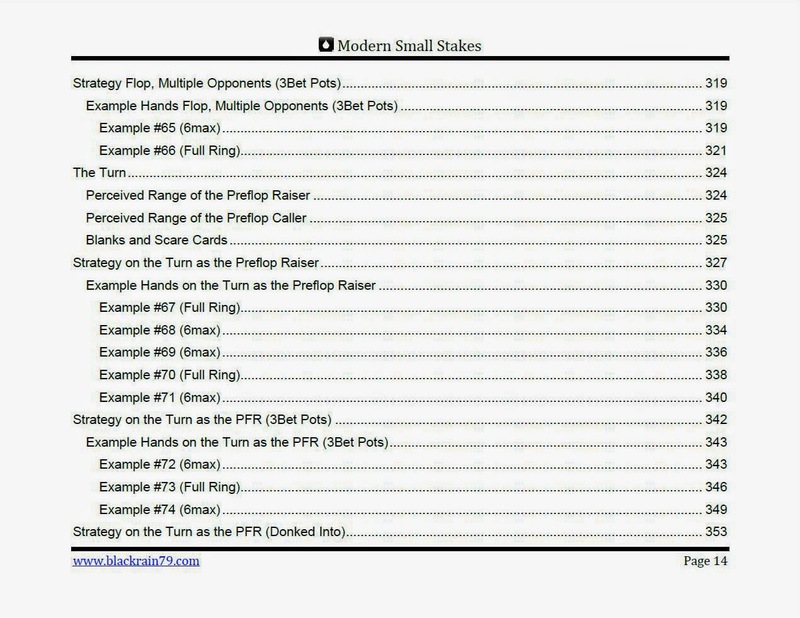 Sorry but Modern Small Stakes is only available in English. I do not have any plans to translate it right now.